Robert B. Potter (1829-1887), Brigadier General, USA (NY). Participated at Roanoke Island, New Bern (WIA), Cedar Mountain, 2nd Manassas, Antietam, Fredericksburg, Vicksburg, Jackson, Knoxville, VA Overland campaign, Battle of Crater, WIA 5/2/65. 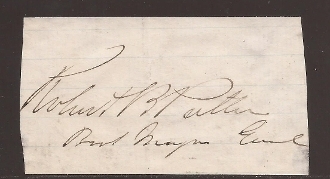 Clip autograph with rank as Bvt. Maj. Genl.